Former Huskies standout and Seahawks free agent Kasen Williams (82) puts the tag on an assistant coach during rookie camp May 9, 2015, at the VMAC in Renton. 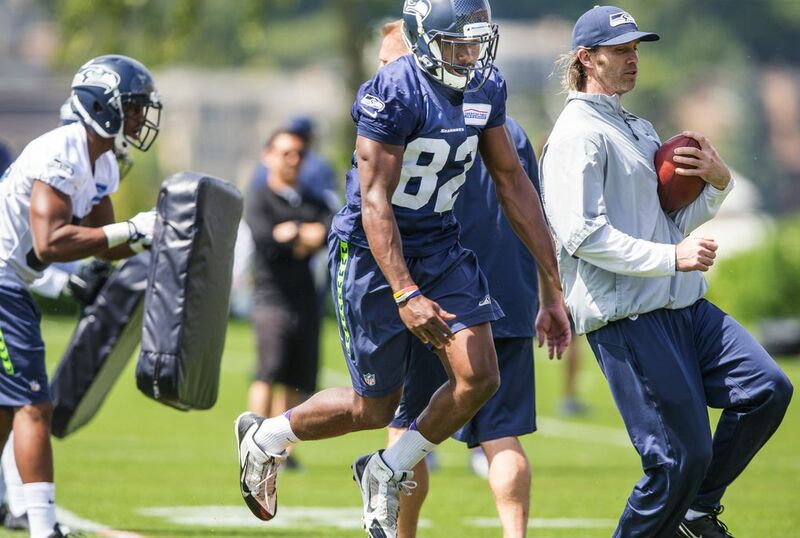 The Seahawks on Friday signed receiver Kasen Williams, a former UW and Skyline High star, as an undrafted free agent. The Seahawks on Friday signed former University of Washington and Skyline High School standout receiver Kasen Williams. Williams impressed the Seahawks during last month’s rookie minicamp, in which he participated as a tryout player. Before that, he had signed as a free agent with the Bengals but was waived after failing his physical, apparently due to concerns over the foot injury he suffered as a junior at UW. 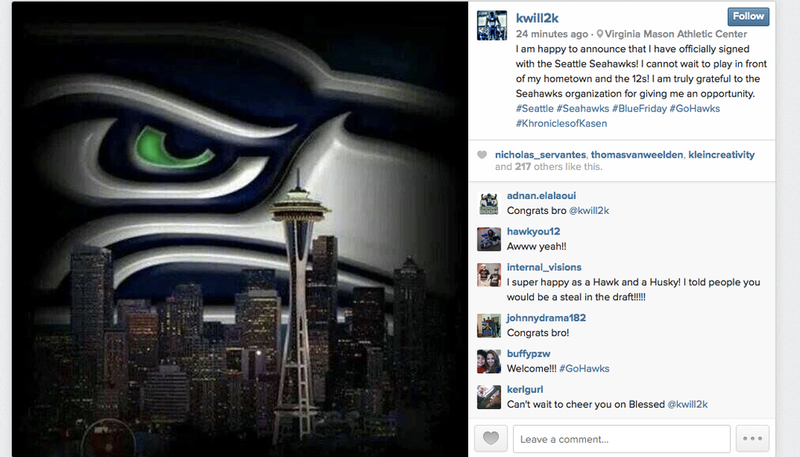 The Seahawks waited to sign Williams because he could not take part in organized team activities the past few weeks. UW has yet to hold its graduation, and NFL rules preclude rookies from taking part in OTAs until their senior class graduates. UW will hold its graduation Saturday, and Williams will be able to take part in minicamp next week. The minicamp includes one practice open to the media Thursday. Williams was one of the most-decorated high schools players in Washington history, helping lead Skyline to three state titles. Among other honors, he was named the Parade All-America National Player of the Year, the first player from the state to receive the award. His UW career got off to a good start, highlighted by his sophomore season in 2012 when he had 77 catches, third-most for a season in UW history, He finished third in school history with 162 career receptions, and seventh in career yards with 1,915. However, Williams suffered a broken left fibula and a Lisfranc fracture in his left foot while leaping for a catch against California in October 2013. He had just 20 receptions as a senior in 2014, which helped contribute to him going undrafted. It won’t be easy to make the regular-season 53-man roster, however, as the Seahawks project to have a deeper and better receiving corps than a year ago. The signing of Williams gives the Seahawks 12 receivers on their roster — Doug Baldwin, Jermaine Kearse, Chris Matthews, Paul Richardson, Kevin Norwood, Tyler Lockett, Ricardo Lockette, Douglas McNeil, B.J. Daniels, Deshon Foxx, Kevin Smith and Williams. Smith and Kearse also are former Huskies who signed with the Seahawks as undrafted free agents. Williams is one of the bigger receivers on the roster, however, listed at 6 feet 1 and 220 pounds. In terms of weight, the only receivers who are close to that are Matthews (6-5, 218), Daniels 5-11, 217) and Smith (6-0, 218). They waived linebacker Mister Alexander to make room on the active 90-man roster. They had signed Alexander, who played in 12 games as a reserve for the Texans in 2011 and 2012, as a free agent in March.